In the spring, when we Pacific Northwesters are just getting the growing season under way, our supermarkets are full of seasonal produce from other parts of the globe. It’s my normal choice to not purchase food products that have travelled from far away, as an attempt to lessen our carbon footprint. However, when those well-travelled items go on sale, before they head to a dumpster, I’d rather buy them than have them go to waste. I purchase organic produce as often as possible, and completely avoid products from China because of questionable growing practices. Recently, I’ve found on sale Organic Navel Oranges, Kiwi’s, Limes, Ginger and Organic Lemons from the USA and Mexico. Along with using these items in our daily meals, I also preserved some of these flavours for use throughout the year. With the oranges, I made a large batch of marmalade. The sweet Navel oranges didn’t have the bitter tartness of Seville Oranges (a typical choice for Marmalade) so I named this creation, Orange Jamalade. It’ll be great on toast, tea biscuits or pancakes. Two tablespoons of Orange Jamalade mixed with two tablespoons of soy sauce makes a simple, but spectacular tasting, glaze for chicken or ribs. Here is a few pictures from my Jamalade process. 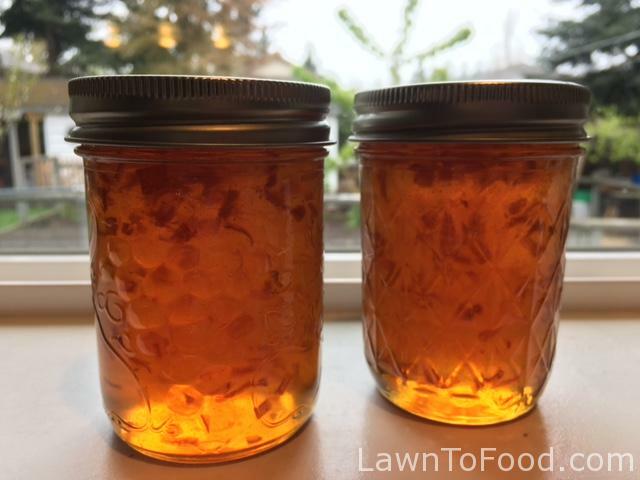 I wasn’t perfectly happy with the recipe that I used, so it is not included here but the techniques are typical of Marmalade making. 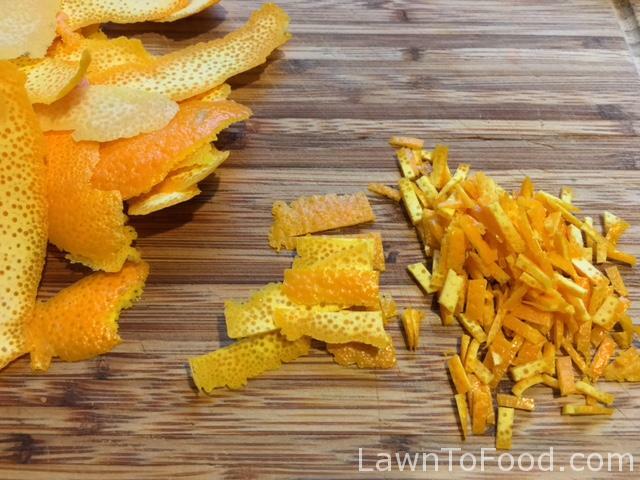 I use a potato peeler to remove the flavourful peel away from the bitter pith of the orange. 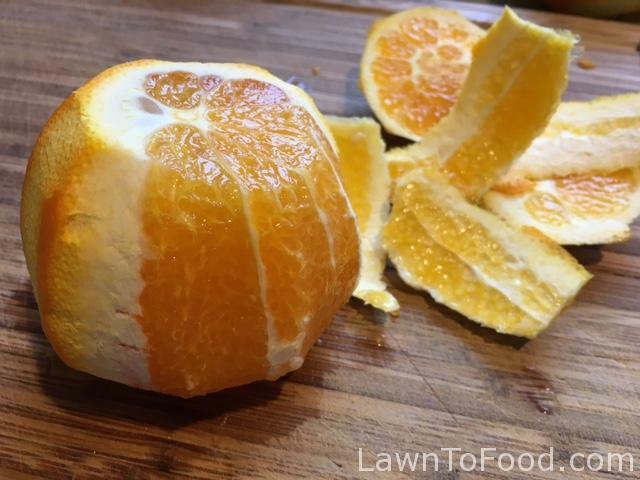 The pith and the seeds of citrus fruit contain pectin and are therefore simmered with the fruit juice. 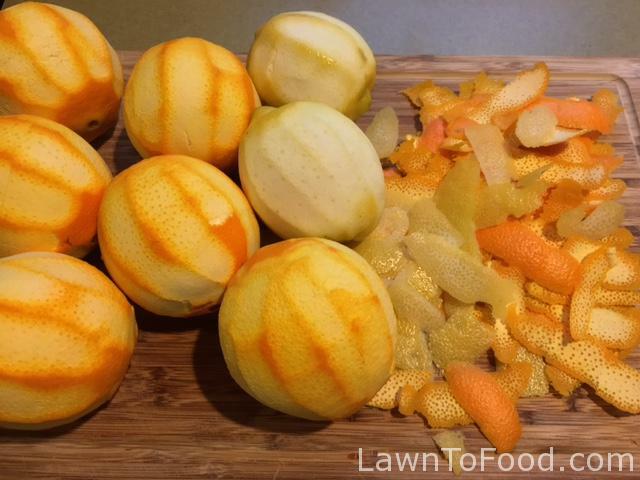 If you don’t use enough seeds and pith, packaged fruit pectin may have to be added to help the marmalade set. 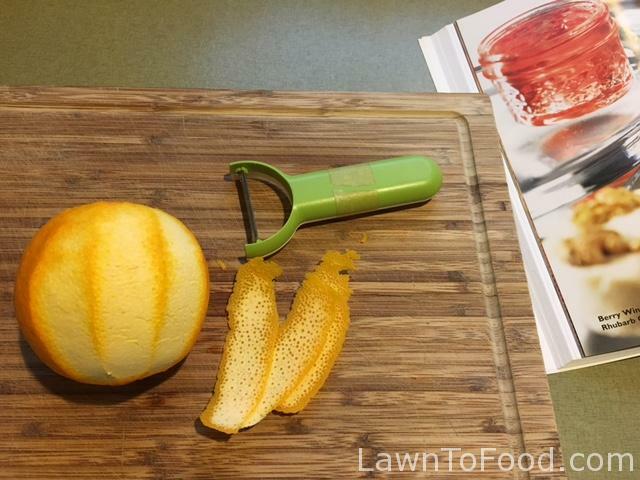 Lemons contain more pectin than Navel oranges, so I included a couple of them in my recipe. 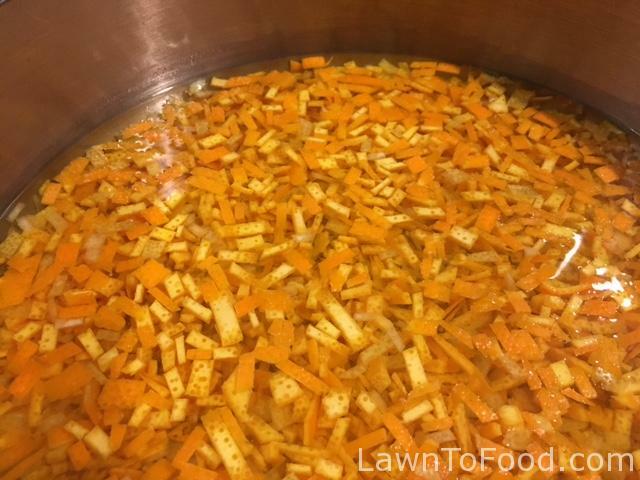 The peel is chopped into small silvers and then simmered separately until it is soft. 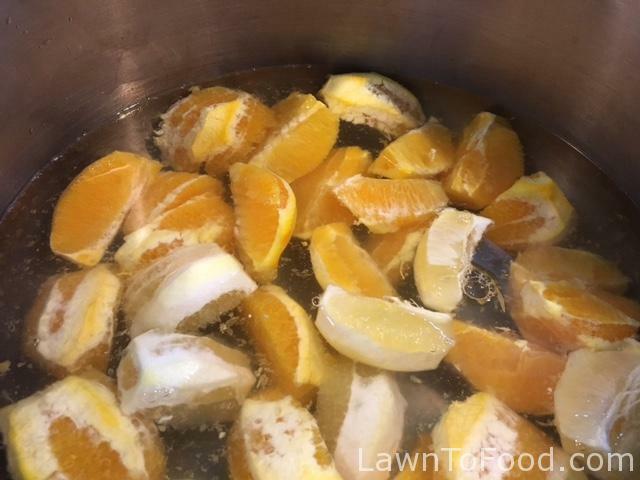 I removed some of the pith from the oranges and then simmered the fruit sections with a small amount of water before straining the juice off. 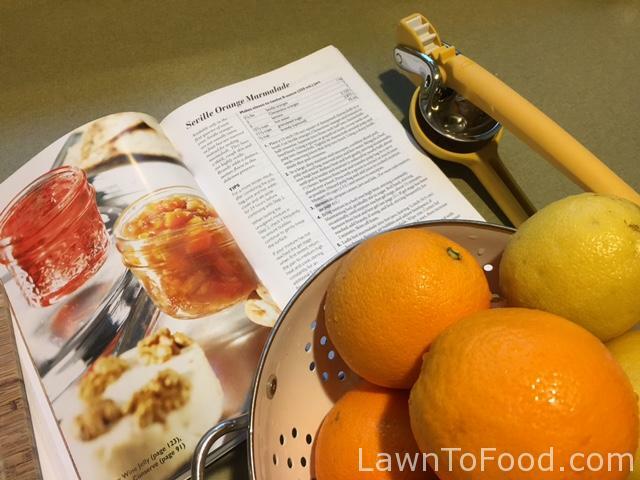 My next project recipe was Lemon Ginger Marmalade. 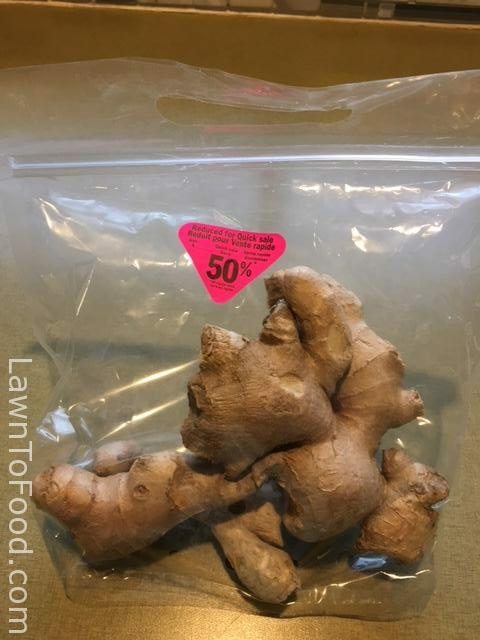 This package of perfectly fine ginger was only $1.39 on sale. I used 1 cup of it in my recipe and froze the rest. Frozen ginger can be grated with a micro-plane for future recipes and dipping sauces. I used a mandolin to slice the peeled ginger thinly and then a sharp knife the cut it into long slivers. 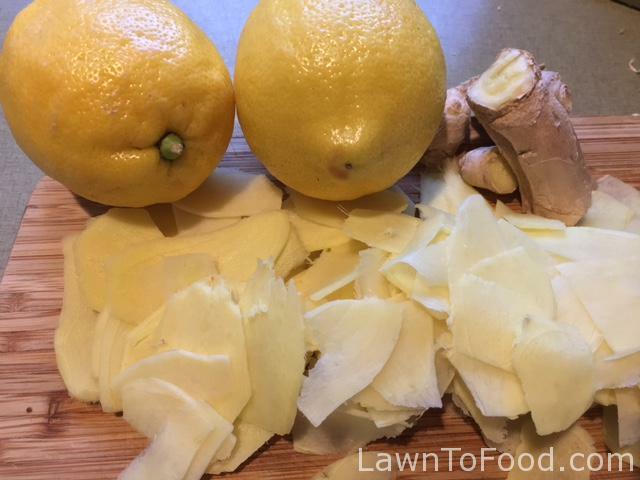 I peeled the lemons with the potato peeler and cut it into slivers as well. All of the peel, ginger and juice from 8 organic lemons was simmered together for about an hour. I added sugar to the mixture to complete the recipe. Once it was thickened nicely and ready for jars, I tasted it. Umm, the flavour was really good but I was not happy with the chewiness of the lemon peel. I should have sliced it thinner or cooked it longer. 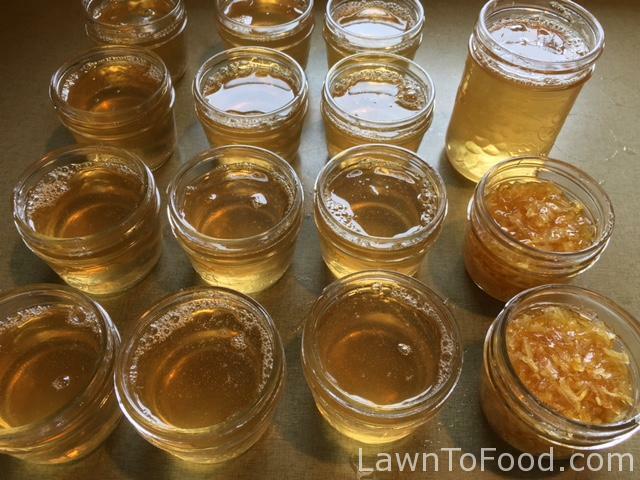 Rather than preserve something that I was not happy with, I strained off the peel and ginger and created Lemon Ginger Jelly instead of marmalade. The jelly is awesome! It is sweet and tart and full of kick. This is going to be excellent on toast or tossed with Asian greens. My surprise bonus for this batch was the candied lemon peel and ginger that I reserved when straining the jelly (the 2 jars on the bottom right). The homemade candied peel will be perfect for Christmas baking, instead of purchasing the dyed-with-who-knows-what store-bought candied peel. 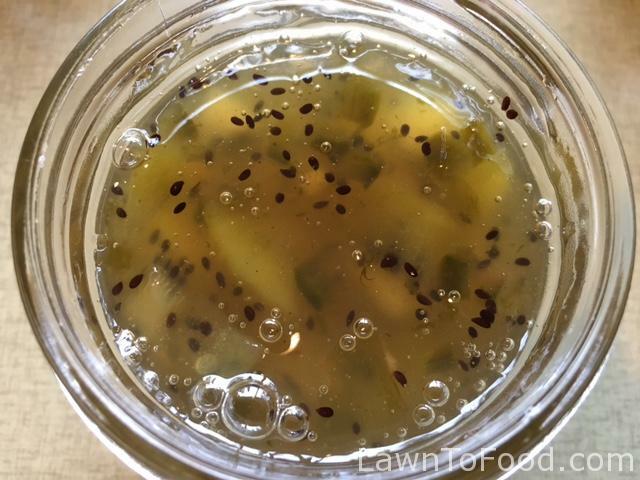 Next on my list that day, was Kiwi Lime Jalapeno Jam. This is basically the recipe that I followed except I doubled it and used lime juice instead of water and added two tablespoons of lime zest to the pot. I used up some diced jalapeno that I had in the freezer from last summer’s garden as well. Kiwi tastes amazing when it’s in season. I picked up around 20 for under $5. My grandsons have eaten most of them but some have been preserved into a quick appetizer conserve. 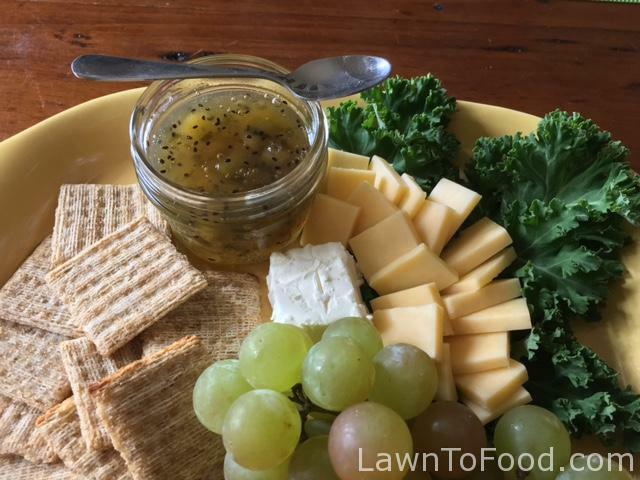 Pepper Jellies are always excellent with cheese and crackers and this is no exception. An amazingly yummy sweet-heat treat!